If you happen to be in Australia on the 25th of April of any year you may witness the Anzac day tradition celebrated. These celebrations are an important part of Australia’s culture. Join in and immerse yourself in a truly Australian tradition. You will find people watching marches in towns all across the country, You will find crowds at Cenotaph’s at sunrise and people sharing a drink and a yarn at the local RSL. I wrote this post last year and just decided not to use it so close to the centenary. This year ANZAC Day is just as important as last and although the girls won’t be marching down our main street, we will be standing on the side cheering our local heroes as they march for us with pride. This year, 2015, marks the 100th anniversary of the landing at Gallipoli. 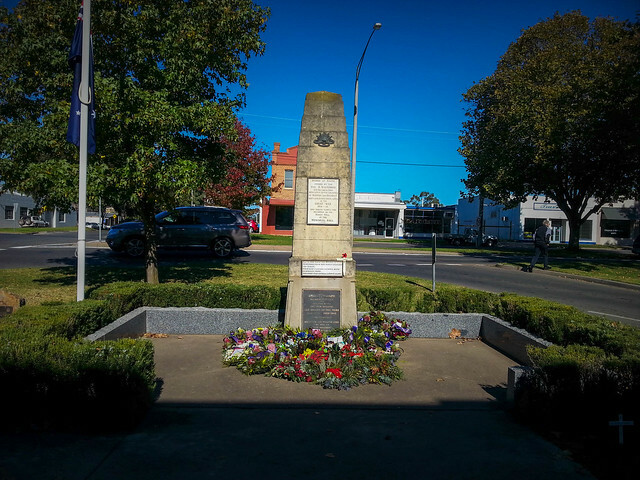 Each town has a cenotaph as a war memorial. This is our hometowns memorial to our fallen. Australian and New Zealand Army Corps. The legend of the ANZAC’s was born in Gallipoli and although at war on the Turkish Coast our Diggers were known for their determination, resilience and never give up attitude. They faced an equally determined opponent with the odds of victory stacked massively against them. They are one of the reasons I am proud to be Australian and why the ANZAC Day tradition lives on. As I said before, this year marks the 100th anniversary of our landing at Gallipoli. For so many more reasons this was a year to acknowledge so many sacrifices made by the serving men and women of that time. Record numbers turned out at Anzac Cove in Turkey for the dawn service, where this all began. At home, there were again record numbers at every cenotaph from the biggest cities to the smallest country towns. 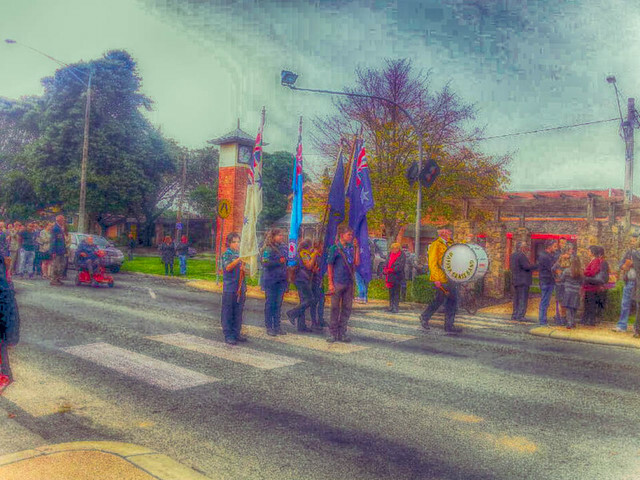 Our girls Willow and Marley marching in the ANZAC Day march in our hometown. The R.S.L in our town and others around the district decided on this anniversary school children would march in the parade carrying a cross for a fallen soldier from our area. There were 128 crosses in all. That does not seem like much but our town is of about 3500-4000 people right now, 100 years ago this would have been significantly less and losing 128 able bodied young men must have been devastating to everyone locally. We are a farming community and have been for a long time, so our area is quite large and spread out. The R.S.L asked schools for a certain amount of children to carry a cross and at our school the response was amazing. We had about 68 children want to march down our main street in the parade. Because of the large number of children that wanted to participate the girls marched together and carried the cross between them. Our cross was for a young man called S. Coleston. We didn’t know much about him when they carried the cross on ANZAC Day but since then we have had some information given to us about where he was sent overseas. 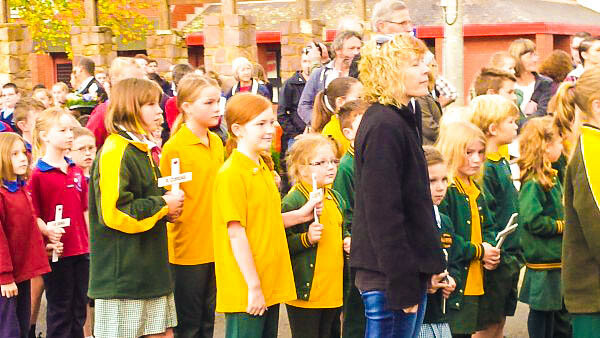 I watched my girls as they carried Mr Coleston’s cross with pride and respect along with all the other children there on the day. Even when it started to rain they carried on without complaint. 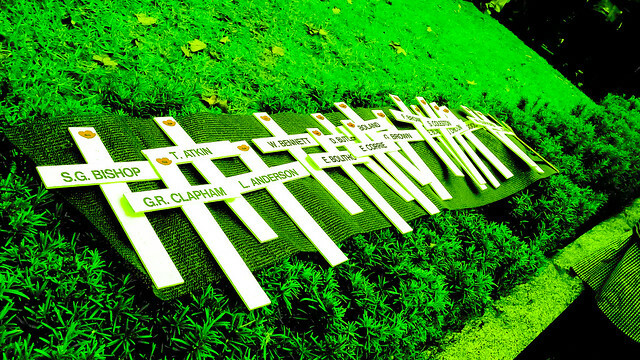 At the cenotaph, our crosses were laid out. Seeing them all there together again brought home the significance of the day and our tiny communities sacrifice. After we talked about what the day had meant to us, I was surprised about what the girls had said. For Willow, it was about acknowledging service men and women and what they gave up to serve our country. For Marley, it was about making sure it was never forgotten and that we don’t fight anymore. So Mr S. Coleston, wherever you are, I hope you looked down on my daughters with pride as they walked your cross down our tiny, beautiful main street to the cenotaph that bears your name. I hope you feel as much pride in them as they did for you and for the honour that they had on that day to remember you. This is so interesting to me! I’m not incredibly familiar with Australian holidays, so thank you for posting! Such a lovely post! Thanks for sharing. I had no idea about this battle or this tradition. No wonder you are so proud! What a beautiful tradition. Thanks for sharing! I like timing our trips to coincide with festivals / important events when we can. It really helps us to learn more about the culture. Sounds like Anzac day would be good to keep in mind when planning our Australian adventure. This is such an interesting tradition. I love traveling for the purpose of learning more about culture. Might have to travel to Australia to experience ANZAC Day myself! Funny, I have a couple of Australian friends – an ex-boss and an ex-colleague who never mentioned this day! It sounds like it is important to Australian culture, so I am definitely going to have to check in with them on that! Also, planning to get to AUS one day, so I should maybe plan it for April! This is beautiful and such a great way to honour those who have served for their country. I have family in Australia and am very familiar with how important it is for people to take part in ANZAC day.